Public service campaigns are encouraging people to eat more fruits and vegetables to maintain a healthy lifestyle. Despite years of media publicity, 85 percent of Americans are not even eating the minimum recommendation of five servings of fruits and vegetables per day. Those who do report eating some produce often fail to consume the yellow and purple colored plants that are critical components of such a program. Life Extension Mix contains 93 unique vegetable, fruit, and herbal extracts along with high-potency amino acids, vitamins, minerals, and special antioxidants. The Life Extension Mix formula is fortified with botanical extracts that help maintain healthy cells via physiological processes separate from traditional antioxidants. Consumption of these types of plants is being recommended based on research emanating from the world's most prestigious medical centers. “Next Generation” Pomegranate Fruit Extract. - Many products on the market contain pomegranate standardized to ellagic acid – a potent antioxidant. However, subsequent research has shown that ellagic is not the most biologically active and absorbable polyphenol in pomegranate. Punicalagins are the new “shining star.” The ellagic-acid based extract in Life Extension Mix has now been replaced by a high potency punicalagin-based extract. Higher Potency Green Tea. - The new Life Extension mix now has the highest potency green tea available with higher levels of the important EGCG. The new Life Extension Mix provides 325 mg of a decaffeinated green tea extract that is standardized to contain 98% (318.5 mg) of polyphenols and 45% (146.25 mg) of Epigallocatechin gallate EGCG) which scientists attribute to green tea's health benefits. The amount of polyphenols (including EGCG) in Life Extension Mix is equivalent to drinking about 3-6 cups of green tea per day. “Next Generation” Chromium. - Life Extension Mix now contains a superior and biologically active trivalent chromium complex, a unique food form bio-organic water soluble matrix. It has shown to reduce blood-glucose levels by 33% compared to control. Chromium helps insulin metabolize fat, turn protein into muscle, and convert sugar into energy. Chromium, along with magnesium and biotin, are nutrients required to maintain healthy blood sugar levels in those already within normal range. 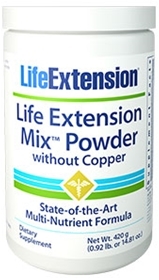 Life Extension Mix provides 500 mcg of chromium. A review of studies showing the benefits of chromium supplementation reveals that doses exceeding 200 milligrams per day are required for optimal effects. Higher Potency Magnesium. - Magnesium is needed for more than 300 biochemical reactions in the body. It helps maintain normal muscle and nerve function, keeps heart rhythm steady, supports a healthy immune system, and keeps bones strong. Magnesium also helps regulate blood sugar levels, promotes normal blood pressure, and is known to be involved in energy metabolism and protein synthesis. The Life Extension Mix now provides 100% of the Daily Value. Luteolin is a flavonoid found in parsley, artichoke, basil, celery and other foods. When measured against 27 other flavonoids, luteolin provided the best DNA protection. One favorable mechanism of luteolin is its ability to inhibit oxidative damage to cellular DNA. Another unique benefit is luteolin's ability to suppress excess levels of dangerous inflammatory cytokines such as interleukin -6 and interleukin 1B. Life Extension Mix contains a standardized dose of 8 mg luteolin. Broccoli is touted as one of the most important vegetables to help maintain healthy DNA. Broccoli contains several active constituents, with sulphoraphane being the most significant because of its unique detoxification and DNA protecting effects. The new Life Extension Mix provides a concentrated broccoli mixture that provides standardized extracts of sulphoraphane and glucosinolates, two compounds attributed to broccoli's multiple protective benefits. Broccoli is also a natural source of gene protecting chlorophyll. D-glucarate is a botanical extract found in grapefruit, apples, oranges, broccoli and Brussels sprouts. D-glucarate effectively supports a detoxification process that helps to remove DNA toxins from the body. The daily dose of Life Extension Mix provides 200 mg D-glucarate. Lutein, an extract found in spinach and collard greens, has been shown to help maintain critical pigments in the eye macula, while the carotenoid alpha-carotene has demonstrated antioxidant activity far grater than beta-carotene. Lycopene from tomatoes has shown potent effects in helping to maintain healthy DNA structure and protect against LDL oxidation. Life Extension Mix contains 60 times more lutein and 10 times more lycopene compared to Centrum. Most multivitamin supplements provide no vegetable extracts whatsoever. Life Extension Mix is also fortified with fruit extracts such as bilberry, grape seed, grape skin, and citrus bioflavonoids to provide healthy circulation throughout the body and maintain healthy DNA. The media has publicized the multiple benefits of fruits such as blackberry, cranberry, elderberry, cherry, plums and persimmon. Life Extension Mix has a customized blend of these and other fruits that studies indicate provide multiple favorable effects in the body. Olive oil consumption is one of the important factors behind the health benefits of the "Mediterranean Diet." Researchers have discovered that there are up to 300 times more polyphenol compounds in olive water compared to olive oil. Olive polyphenols have been the subject of numerous studies pointing toward their benefits in many different areas, including helping to protect against LDL oxidation, suppressing free radicals, and stabilizing cell membranes. Life Extension Mix contains a potent olive juice extract standardized to contain 7 percent of the best-documented polyphenol called hydroxytyrosol. The amount of hydroxytyrosol in Life Extension Mix is equivalent to drinking one ounce of virgin olive oil per day. Sesame lignans enhance the effects of vitamin E. - Sesame and its lignans have a broad range of applications in human health. This includes increasing human tissue levels of vitamin E by facilitating carrier proteins in the liver to deliver nutrients to cells throughout the body. Sesame lignans increase the anti-inflammatory index of fish oils and help maintain healthy cholesterol/LDL levels in those already within normal range. Life Extension Mix contains 10 mg sesame lignan extract to provide the direct benefits of the lignans and augment the effects of vitamin E and other nutrients in the body such as gamma-tocopherol and gamma-linolenic acid (GLA). High potency vitamin D3. - Doctors used to be concerned that too much vitamin D could be toxic. Over the past few years, however, an increasing body of evidence indicates that it takes much higher doses of vitamin D (perhaps over 10,000 IU/day) to inflict toxicity on a healthy person. The concern expressed by researchers today is that fear of vitamin D toxicity is keeping many people from supplementing with enough vitamin D, which is critical for maintaining bone density. In response to studies showing that even those who take standard vitamin D supplements are not obtaining adequate amounts, Life Extension Mix provides 800 IU vitamin D3 per daily dose. Life Extension Mix saves time and money by combining the most popular nutrient supplements in one product, eliminating the need to take separate bottles of B-complex, vitamins C and E, mineral supplements and much more that would be required to achieve the same effects. Life Extension Mix supplies the most powerful antioxidants, including water and fat soluble vitamin C, the ideal form of alpha vitamin E, and plant extracts that help protect against cellular DNA damage. Other ingredients in Life Extension Mix enhance beneficial DNA methylation patterns, and help maintain glycemic control and healthy levels of LDL in those already within normal range. Life Extension Mix is the cornerstone of a comprehensive supplement program because it provides so many well-studied nutrients. If you are on a budget, Life Extension Mix provides the best cost per milligram value. With the addition of the newest ingredients, Life Extension Mix has become an even greater value. Other ingredients: maltodextrin, natural orange flavor, stevia extract, dicalcium phosphate. Contains milk and soybeans. Contains yeast, corn, and sesame. This product contains NO egg, fish, peanuts, crustacean shellfish (lobster, crab, shrimp), tree nuts, wheat, gluten, or rice. Contains NO artificial sweeteners, flavors, or colors. Take three scoops per day in divided doses with meals, or as recommended by a healthcare practitioner.